My heart goes out to my Facebook friends caught up in the tornado watches and extreme weather. One FB friend lives in Moore. I’m happy to report her house and hounds are all safe. So is she. But it’s especially hard for me to watch the images on TV of injured people and animals coming out of the wreckage. Back in 2006 I lost my home and virtually all my possessions to a natural disaster. I kept a blog about my journey (since taken down), and someday I’ll share those posts again. Just not now. Strangely, reading all the tornado-related FB posts and comments doesn’t make me think of that time in my life. Instead, my thoughts were on the pets of those affected by the tornado. And then I started thinking about my pets, and my history with hounds. So, I thought I’d share a bit about myself and my dogs. Upon reflection, I think I may have rushed into my next dog, Frankie. I adopted her on June 16th of that same year. I’d always loved Bloodhounds, read up on the breed, and was absolutely certain I knew what I was getting into with a hound. Ummm, no. 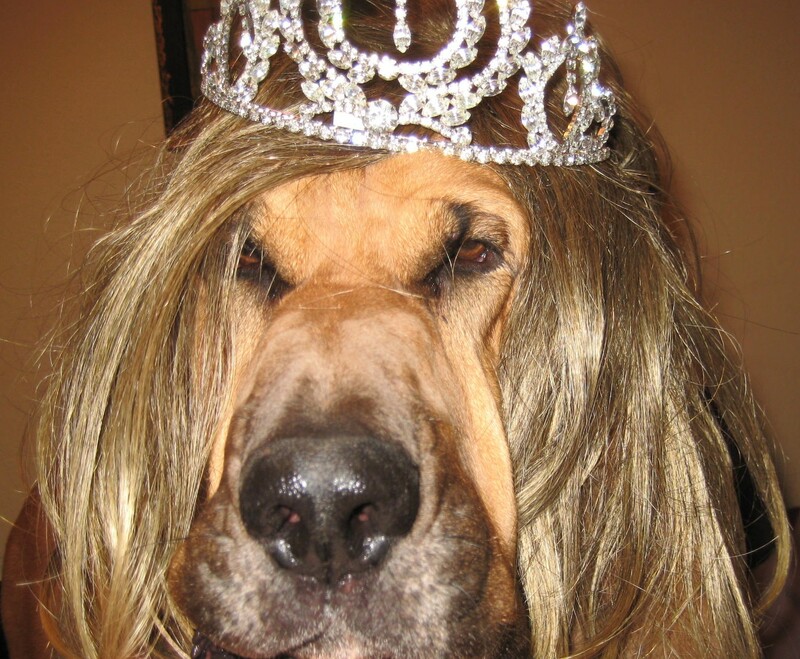 No one is ever prepared for their first Bloodhound. At that time, all I knew was that I wanted the opposite personality of Max, because no dog could ever replace him, and I didn’t want to be reminded of traits I missed so much. Boy-oh-boy did I ever adopt the total opposite personality! Max: loyal, prey-driven, obedient to a fault, learned commands quickly. Almost never on leash, even out in the brush where I couldn’t see him. Yet I’d call and he’d be bounding through the underbrush to return immediately. Frankie is my first Bloodhound. 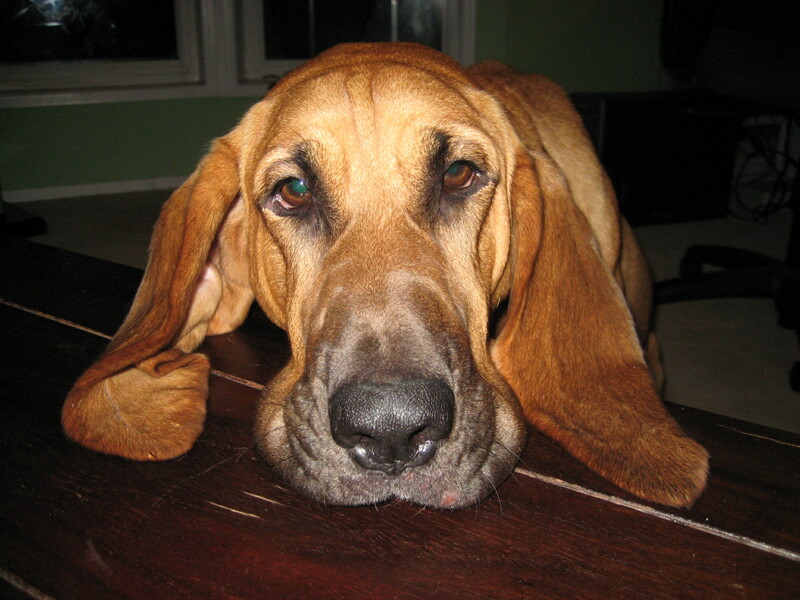 In my childhood, my Bloodhound was a stuffed toy I cherished. Sometimes I call Frankie my “starter hound”… because eventually I’ll adopt another. 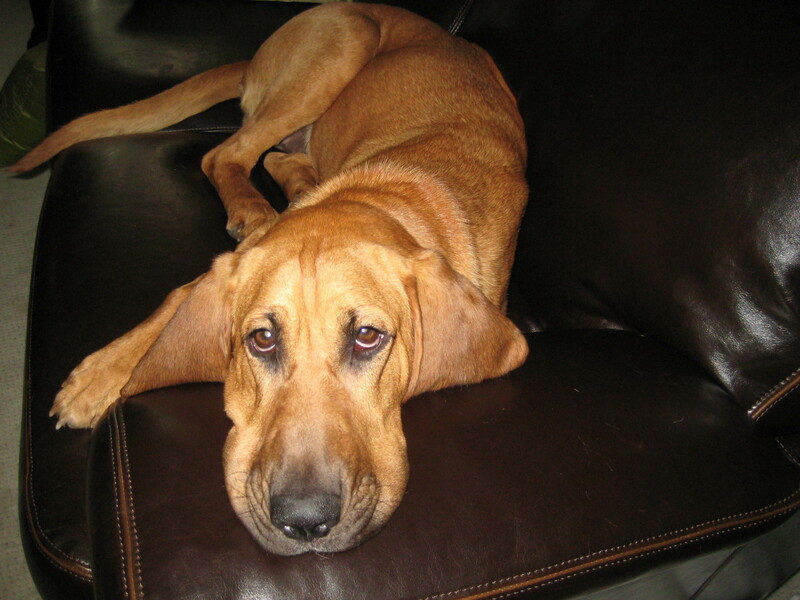 She’s a smallish 85-pound hound with a busted tail. The tail didn’t happen on my watch. I adopted her at 2 (?) years old, and 65 pounds, from a Lab rescue where she and the other dogs were fed once a day. These folks did the best they could and I am grateful. Anyway, she FREAKS OUT on other dogs who happen to be around food. Any food. Otherwise she plays well, just as long as treats aren’t involved. This limits socialization, but not group walks or training. On training: she’s stubborn. I’ve tried obedience. The entire class cracked up with laughter as Frankie became more and more determined to not do anything I asked her. For example, it took three of us, me the trainer and the trainer’s assistant to get her to lay down. Me pushing her shoulders down and the other two easing her front paws forward. Frankie tensed her entire body, like a steel tripod, refusing to cooperate. At home, relaxed, she’s pretty good with commands. Right up until she decides not to do something. I’ll give her a command (“sit!”) and she’ll crane her head up, bat those beautiful eyes, and ignore me. It’s like she’s saying, I know exactly what you’re asking me to do and I’m not doing it. I might even get a little tail wag with that “no.” So there! She’s a gentle girl who worships, and fears, cats. She’ll get spooked by litter floating in the breeze, but she’s fine around gunshots. She’s always on leash except when she’s in a fenced area or inside. Her brain seems to be 98% in her nose. Doorbells drive her bananas. And sometimes, when I look in those gorgeous brown eyes of her, I’d swear she is my grandmother reincarnated. Maybe that sounds a little kooky and I shouldn’t have shared that here, but what the heck. I really do think she is my mom’s mom returned. So I’ll end this post on a question: do you think our loved ones can reincarnate as our pets? This book is a humorous introduction to the basics of Buddhism according to Frankie the Bloodhound – debut author, kitty enthusiast, and seeker of higher thought. She has compressed thousands of years of spirituality into 39 nuggets of wisdom in this unique canine interpretation of enlightenment that will delight dog lovers as well as readers on the trail to greater awareness. Only 99 cents on Amazon! Like many bloggers, in the closing days of this year, I am reflecting back on the months. Successes, disappointments, frustrations, and a lot of laughter, too. It’s all there. But I was also tried to recall a single moment that really stood out from the rest. There was that ONE moment. My memory jogged back to the T-mobile store a couple months ago, and I shuddered. As the sales guy wrestled my phone open to replace my fried SIM card, a shower of dog hair floated from the phone’s guts to the countertop. How does dog hair get INSIDE my phone? Does she secretly make calls on it late at night? In that moment, I felt my face burning. Dog hair? Inside my phone? Who has dog hair inside their phone? The embarrassment was quickly followed by surrender. 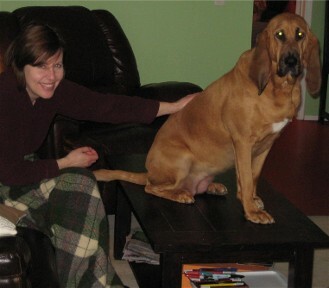 I own a Bloodhound. I’m with her almost all day, every day… so now there’s dog hair covering this man’s work station. Apologize profusely. 2. This will never happen again (because I will slide the cover off myself and blow out the dog hair before I return to T-mobile). 3. If I worked there, fixing people’s cell phones all day long, I wonder where dog fur would rate on the scale of gross phone moments? PS- In Frankie’s book, the Wisdom of the Buddhist Bloodhound, there’s no mention of Smartphones, but plenty of humor. I didn’t know there was a danger. Not a clue. One day we’re a normal household of dominant married couple with a docile Bloodhound, the next everything flipped. I blame Star Wars. Obviously, our dog is a Jedi Master with incredible powers. Another example of her control, on our daily walks I know the names of all the neighborhood dogs (Andy, Lucky, Logan, Blue, Riley, Spot and Dusty), but I rarely remember their owners. Humans just don’t seem important anymore. Then there’s the feeding schedule. My husband and I are slaves to it. There’s breakfast, lunch and dinner with snacks between walks, pees… and sometimes for no reason at all. Occasionally there’s the double feed. After I feed Frankie, she will often use the Dog Force on my poor husband. “There wasn’t any kibble in this bowl. You will fill the bowl now. You live to fill the bowl. Burp!” Obi-Wan Kenobi had no idea what he was unleashing on us! So, does your Bloodhound or dog have similar powers? I’d love to hear from you. If I don’t reply to your responses right away, it’s because I have an overwhelming urge to feed the dog a third lunch and rub her belly for an hour.